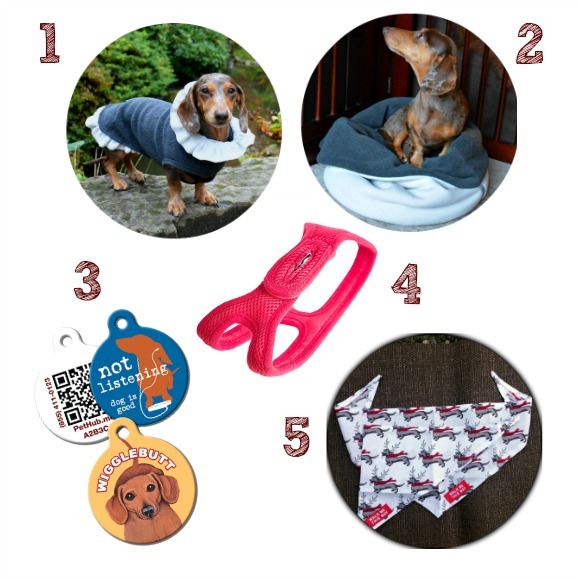 You are here: Home / Reviews / Dog Stuff / 10 Unique Gifts for Dachshunds and Dachshund Lovers! I’ve kept an eye out for cool products all year precisely with you in mind. Every year around Christmas time, I like to share our favorites. This adorable jacket will keep help keep your wiener warm. It’s great as a stand-alone jacket in cool weather or it can be worn as an extra layer under a waterproof jacket (Teckelklub sells those too). It’s made in Canada from 420 weight anti-pill Polyester fleece so it will last a long time and look great for years to come. It’s machine washable, are available in multiple colors, come at an affordable price, and ship hassle-free to both the US and Canada. The easy-on, easy-off design to slips over the neck and velcros at the chest. There is also a version without the ruffle, and with a reflective band on the collar, called the Fuzzie. This snuggle sack is a great gift for Dachshunds, below 22″ in length, who like to burrow (don’t they all?). The innovative two-in-one design works as both a burrow bed and a double thick floor blanket. The version pictures is made with 4 layers of the same high-quality fleece as their jackets but it also comes in a quilted-fabric version. Tekelklub products are made in Canada but they have a US shipping location too for hassle-free delivery. Digital ID tags offer several advantages over traditional ID tags. Each PetHub tag has a QR code that links to an online profile where you can list as many ways to contact you, and vets, friends, or family, as you want. Because this information lives online, you can easily update the information when you move or while you’re traveling. As a backup, this information can also be accessed via a website and unique code. One of the best things about this tag is that the finder can also call a the 24-hour, toll-free, found pet hotline. People who find your pet can call this number any time of the day or night and get a real person who will help them get your pet back to you. The Not Listening tags are perfect for Dachshunds. This harness is a great solution for preventing dogs that pull on the leash from choking. It’s comfortable enough to be worn 24-hours a day if needed (like if you are traveling or have a dog on crate rest). It comes in several colors and sizes and can be thrown in the wash when dirty. For more details, read my review. 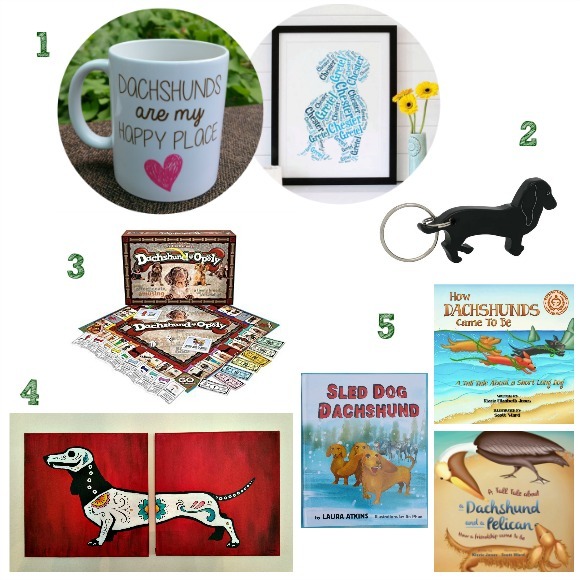 Love at First Bark Designs allows you to customize this cute coffee cup with your Dachshund’s name..
You can order a poster that uses your pet’s name to make a word cloud shaped like a Dachshund. You can personalize the print with up to five names if you have more than one dog. Other breed-specific custom products are available. For an excuse to show off your wiener at a party, carry this Dachshund bottle opener with you. Maybe it will grab someone’s attention and give you a reason to gush about how much you love your dog. This classic board game has a Dachshund twist. During this fun game, you can increase your rent by buying toys for your dogs and upgrading them to big bones, get fleas, have an accident on the carpet, or worse yet, get sent to the kennel. Invite all your Dachshund, or dog-loving, friends over for a good laugh. Sugar Skull everything is popular right now. For that special person in your life, or yourself, get this unique, hand-pained “Day of the Dead” Dachshund painting. The artist is currently adding more paintings to his store. If you don’t see the Dachshund painting, contact him for a custom order (I know the guy personally and he’s really nice). Just know there is quite a bit of lead time for these so be sure to contact him early or be willing to slip a picture of the paining in a card to let the person know what is coming. It’s so cool though that I’m sure your friend or loved one won’t mind waiting. These kids books also make great coffee table books. The illustrations are great and both share valuable life lessons. Choose from the Sled Dog Dachshund book about a pup from Alaska that doesn’t let others discourage him or the TALL TALES books about celebrating what makes us unique. Thanks Jessica for the TALL TALES shout out! 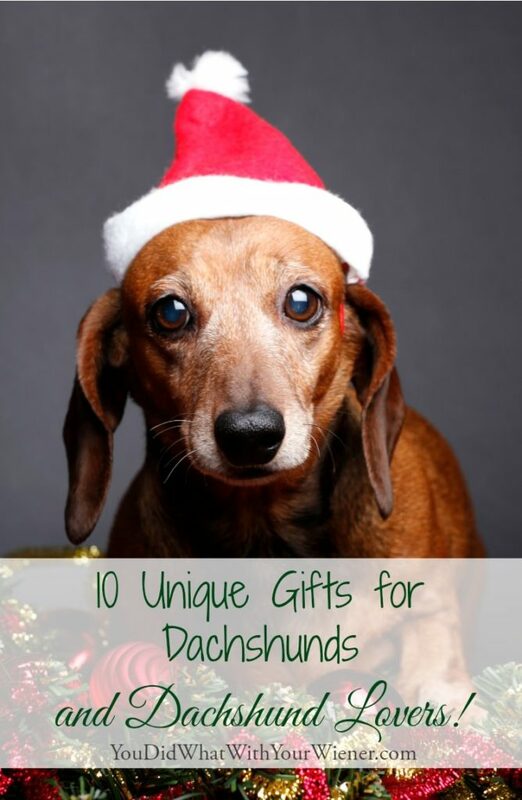 Appreciate all the research and suggestions about everything DACHSHUND! These are wnderful ideas. Thank you for doing all the work. I just bought two of the cutest dachshund Christmas finger tip towels at Sears. 99 cent each but I used my Shop Your Way Points so they were free. Thanks for this list! My sister is a kindergarten teacher and she has a dachshund-corgi mix that the kids LOVE to hear about, so she’s getting the sled dog book for Christmas! My sister is a wiz in the kitchen and her third dachshund is named Gus. I don’t know if she’ll ever actually use it, but I got her one of these because it was the most unique dachshund-related gift I had ever seen.